What makes a good sports bar? Ample flat screen TVs. Comfort foods and a great selection of beer. Comfortable seating and a welcoming environment to enjoy with friends or family. We’ve found it all and more in these 10 excellent sports bars in New Jersey. Open for 20 years, Avellino’s is a cozy restaurant and sports bar that features TVs scattered throughout the restaurant and at the bar, so you can catch your favorite game while dining. Avellino’s is known locally for their tasty pizza and you can even order pizza by the slice if you are looking for a light snack. The menu also features subs, pasta, soups, and entrees. At Mickey’s Bar and Grill, you can enjoy delicious food while watching the game from several TV screens. Mickey’s Bar and Grill has been voted as having the best wings in Bergen County, which contributes to its status as an excellent sports bar. In addition to wings, Mickey’s also serves burgers, sandwiches, salads, loaded fries, and main courses. Jack’s Goal Line Stand boasts over 50 TVs throughout the bar, thus patrons will be able to watch the game from almost anywhere in the establishment. Enjoy a large menu of pizza, wings, sliders, burgers, and sandwiches while catching the play or waiting for the next inning. Don’t forget to wash down your meal with a pint or two of beer, as Jack’s is known for its excellent selection of craft beers. The fun, family-friendly atmosphere at Ducktown Tavern offers several different happy hours throughout the week and a menu packed with burgers and other typical tavern fare. Watch the big game from your table on one of their many TVs that are located throughout the establishment. Ducktown Tavern is open 24 hours a day, so you can enjoy your favorite meal and sports game at any time of day. Otto’s Bar and Grill has large, flat screen TVs located throughout the establishment as well as several pool tables, dart boards, and a shuffle board. There is also a kids’ zone to keep kids entertained during the game. The food menu features everyone’s favorite appetizers, including mozzarella sticks, wings, and potato skins as well as salads, soups, sandwiches, burgers, and pizza. Full of memorabilia and several TVs, Miracle Sports Pub is a favorite local spot to watch a game. While checking out the photographs on the walls or watching the game, order from their long menu that is packed with numerous options. Menu highlights include a soup and sandwich combo, toasted paninis, hot dogs, pizza, and warm sandwiches. Whistlers Inn is a large, open establishment with an abundance of seating and a long bar backed with several flat screen TVs. Watch the game while re-capping season stats with the bartender or order delicious appetizers and barbecue to share with friends. Menu highlights include the large nacho plates, Buffalo wings made with a variety of sauces, and award winning smoked barbecue served with two sides. Tierney’s Tavern is a two-floor establishment that has been open for more than 80 years. The upstairs recently got two new 37 inch HD TVs to enhance the game watching atmosphere. Tierney’s features a classic menu, with wings, hot pastrami, Taylor ham, and corned beef as well as several sides and draft beer. Tierney’s Tavern is also a popular spot to hear local music. 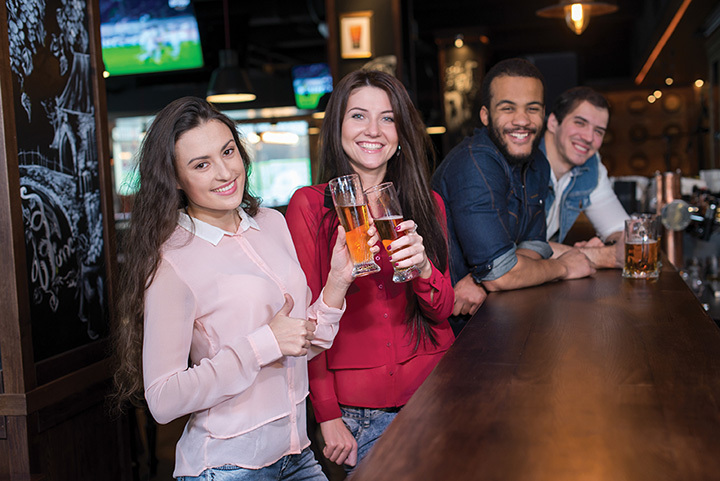 Enjoy the casual atmosphere and good food with your family or friends at 5 West Pub. There are a few flat screen TVs in this establishment and they are angled to allow diners occupying any table or bar stool a great view of the game. The menu features soups and salads, pizzas, burgers, and large meals such as lobster mac and cheese, crab cakes, and chicken marsala. This establishment is both a sports bar and typical diner that is decked out with sports memorabilia and has several flat screen TVs. Phily Diner serves breakfast, lunch, and dinner and also has a Sports Bar menu that is served all day. This menu features great appetizers to share such as pot stickers, pretzels, chicken fingers, wings, mozzarella sticks, and even sampler plates. Happy hour is also offered on Mondays through Fridays from 2 p.m. to 7 p.m.